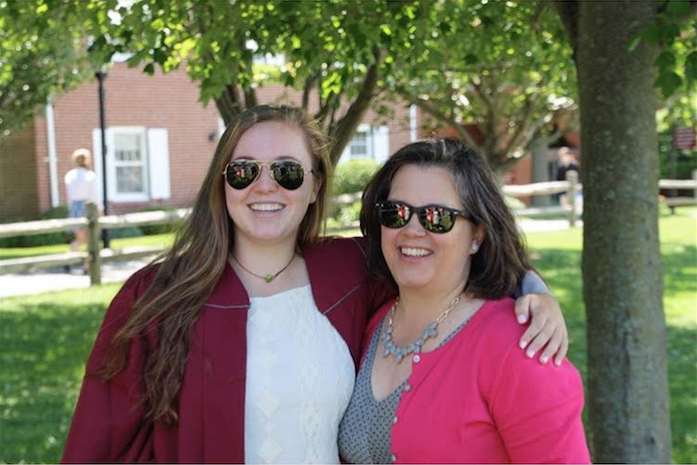 Carla MacMullen, Dean of Faculty, (right) with her daughter, Avery '16 (left). After three decades at Hopkins, Dean of Faculty Carla MacMullen will be leaving The Hill to become Head of Kew-Forest School, the oldest independent school in Queens, New York. After three decades at Hopkins, Dean of Faculty Carla MacMullen will be leaving The Hill to become Head of Kew-Forest School, the oldest independent school in Queens, New York. First a classroom teacher in the science, MacMullen has played a number of roles in diferent areas of Hopkins life, from administration to academics. After receiving a Bachelor of Science degree from Denison University, MacMullen attended a graduate school doctoral program in Chemistry before discovering a placement agency that matched potential teachers with independent schools. Through this agency, MacMullen found Hopkins and started her work as a full-time science teacher, teaching chemistry and eighth grade science. Since then, MacMullen’s role in the Hopkins community has expanded. For the past ten years, MacMullen has been the Dean of Faculty, an administrative role that manages faculty well-being. MacMullen has maintained a faculty review system, managed the hiring process at Hopkins, from reaching out to potential employees to running new faculty orientation, and overseen a master teacher and mentor program for new teachers. As the fnal MacMullen of fve (three alumni children and her husband a former teacher) to leave the Hill, MacMullen’s legacy will remain in the years to come.